The hectic pace of this time of year (grading finals! grading papers! etc!) always makes me think of the music of Raymond Scott (1908-1994), but especially his “Powerhouse” (1937). If you’ve ever watched any Warner Bros. cartoons, you’ll recognize this as the machinery-out-of-control theme. Carl Stalling (1891-1972), who created the scores for those cartoons, made liberal — and effective — use of Scott’s melodies. You can also find great versions of “Powerhouse” by Don Byron (on Bug Music, 1996), Jon Rauhouse (Steel Guitar Rodeo, 2003), the Tiptons (Tsunami, 2007), Quartet San Francisco (Whirled Chamber Music, 2007), the Metropole Orchestra feat. 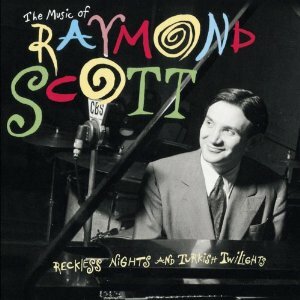 the Beau Hunks (Raymond Scott: The Chesterfield Arrangements, 1999), the Raymond Scott Quintette (Reckless Nights and Turkish Twilights, 1992, and other compilations), and many others. It is, I think, his most popular tune, despite the fact that it’s quite a demanding piece to play.